German idealism was a speculative philosophical movement that emerged in Germany in the late 18th and early 19th centuries. It was a reaction against Immanuel Kant's Critique of Pure Reason and was closely linked with both Romanticism and the revolutionary politics of the Enlightenment. 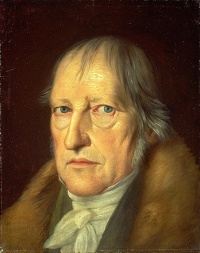 The most notable thinkers in the movement were Johann Gottlieb Fichte, Friedrich Schelling and Georg Wilhelm Friedrich Hegel, while Friedrich Heinrich Jacobi, Gottlob Ernst Schulze, Karl Leonhard Reinhold and Friedrich Schleiermacher also made major contributors. The word "idealism" has more than one meaning. The philosophical meaning of idealism here is that the properties we discover in objects depend on the way that those objects appear to us, as perceiving subjects, and not something they possess "in themselves", apart from our experience of them. The very notion of a "thing in itself" should be understood as an option of a set of functions for an operating mind, such that we consider something that appears without respect to the specific manner in which it appears: correlating more to something like "idea-ism" than the common notion of the idealism. The question of what properties a thing might have "independently of the mind" is thus unknowable and a moot point within the idealist tradition. Unless indicated otherwise, the text in this article is either based on Wikipedia article "German idealism" or another language Wikipedia page thereof used under the terms of the GNU Free Documentation License; or on original research by Jahsonic and friends. See Art and Popular Culture's copyright notice. This page was last modified 12:11, 24 December 2015.